A physical science which deals with the effect of the force of the object. In this, we study about rigid bodies. Free body diagrams and equilibrium; trusses and frames; virtual work; kinematics and dynamics of particles and of rigid bodies in plane motion; impulse and momentum (linear and angular) and energy formulations, collision. 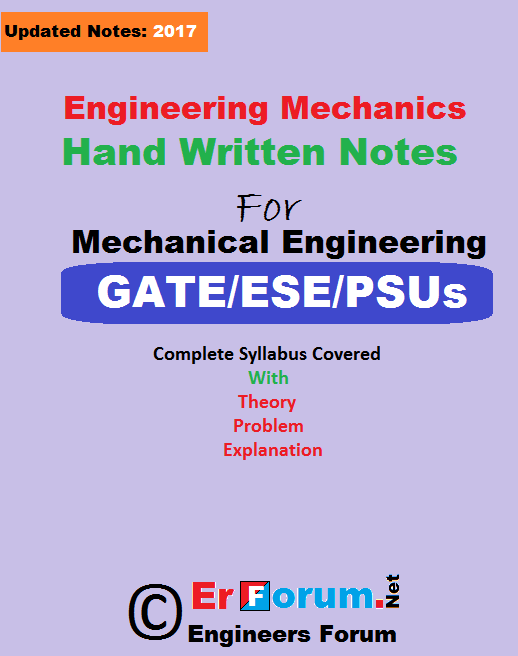 Good Quality Lates Hand Written Notes of Engineering Mechanics is Available in PDF Format. Complete Syllabus Covered of GATE, ESE, PSUs. Theory, Problem, Solution and Explanation in an easy way. This note is written in very neat and Clean way, no blue mark, Print Friendly Version. After Payment, you will get this product at your email Id. Very good....... But some errors...... As it is handwritten...... You can't expect 100% error free. Thanks for the valuable feedback. Please mention the errors, which you have find so, that we can improve and share it with you.